Shampoo removes build-up from accumulated conditioners and styling products. Not meant for everyday use, but to detoxify the hairs as necessary. 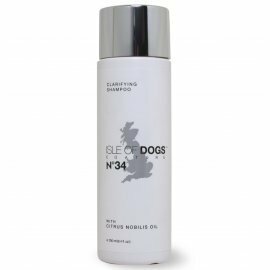 Use this product once a month, or between shows, and follow up with a fresh application of the Isle of Dogs conditioner best suited for your dog’s coat type. For the dog with persistent oily coat or skin, use as often as needed. .